As soon as I'd heard about Waterbaby, I really wanted to check it out so I offered to review it! When I was pregnant both times, pregnancy sickness was a big issue for me, and I often brought my vitamin tablets back up! Not much fun at all! ... Also, I just kept forgetting to take them, and now I'm breastfeeding my 11 week old, I still forget to take my vitamin! 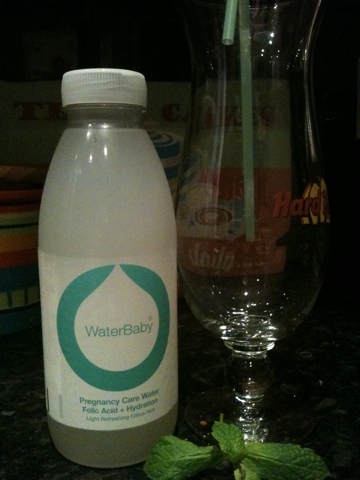 Que Waterbaby pregnancy care water! This is a great idea, this is a flavoured water drink fortified with folic acid and a range of vitamins tailored to offer you extra hydration (with sickness, the extra blood volume and baby growing, you need extra fluids) as well as nutritional support. Waterbaby is designed to be drunk at any stage of pregnancy from preconception, actual pregnancy and breast-feeding. It's a lovely still water, I tried the citrus hint flavour and it was a gentle refreshing lemony lime flavour and tasted good - I was a bit worried you might get the vitamin stuff altering the taste, like when you take a tablet you get a bit of after taste, but there was nothing like that! I'm a bit fussy when it comes to ingredients (actually, I'm just a bit fussy altogether!) and I've been put off flavoured waters in the past as often they contain artificial sweeteners but Waterbaby doesn't, I couldn't see any nasties in the ingredients at all really! So I haven't found any other pregnancy nutrition drinks to compare it to, it does seem to be out there on it's own at the moment and I think it's a nifty idea to help you take your folic acid and vitamins as well as helping you stay hydrated. I do think it is a better choice than a tablet as water helps your body absorb the nutrients and having pregnancy vitamins in a drink form is easier than a tablet (well it is for me!) as you won't sick up all of it as you can just sip it and not as likely to forget to have a drink! Either drink it from the bottle (500ml) or dig out your favourite glass, chill it, pour over ice, add a mint leaf and sip through a straw! More info on the Waterbaby website. Competition is open to all UK mums to be or breastfeeding mums and all you need to do is tell me what other flavours you would like to see, in the comments section below. Bonus entry if you tweet a link to this blog post include (@beachpebble @drinkwaterbaby) or like my blog's facebook page. Please add a separate comment below for your bonus entry so I can include it in the draw. Competition closes at 8pm Sunday 25th September 2011. This is a great idea. I would have loved to have this in the early months of my pregnancy as I found it so hard to swallow tablets with my nausea. I agree a toddler/child version of this would be great too. Oh yum! I do like cranberry too!